A delicious Chicken Marinade Recipe can be so useful to have as a backup for entertaining unexpected guests. I am forever amazed at how few people make use of this amazing way to cook chicken. 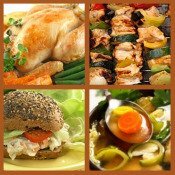 Chicken meat lends itself perfectly to being cooked in marinades and served with sauces. I am quite fond of using both sauces and marinades in a large part of my cooking chicken. . The recipe options are vast and allow for creativity which then makes it a limitless source of inspiration to please my hungry family. Marinades are not just great for imparting flavour to chicken but they act as a tenderizer and moisturizer too. Now chicken doesnt need too much tenderizing unless its a tough old bird but marinating will help break down the meat muscle and connective proteins. Chicken meat is a lean meat so it's lower in fat and the marinade will help to keep it moist while giving a great flavour. In other words they also make chicken more succulent and stop it drying out, especially if you're barbecuing or grilling. A marinade will most often consist of some kind of acid liquid such as vinegar, lemon juice or wine mixed with an oil. Herbs, spices and other flavourants such as Worcestershire sauce (my favourite) or ketchup, or soy sauce can also be added according to the recipe. 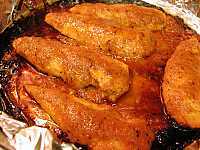 A marinade can also be used as the cooking or braising liquid. In other words a dish like Coq au vin uses a wine marinade that becomes the cooking stock. I find that marinating chicken is easiest in a zip lock bag because you can just turnover the bag in the refrigerator to ensure equal marinating. You can also use plastic, ceramic or glass containers but avoid metal ones as they may react with the the acids and spoil the flavour. It is advisable to always refrigerate marinating meat to avoidthe growth of bacteria. Add a little extra love to your chicken with these great marinade recipes. This delicious Mexican Marinade is so easy to make and coats the chicken pieces in a delicious sticky sauce. Chicken Fricassee Recipe If you like chicken in white wine sauce then here's one to try. A superb chicken in wine sauce recipe. The white wine and cream combination make a beautiful sauce that goes well with the chicken, mushrooms and leeks. Chicken Chasseur is a French bistro classic that combines chicken, mushrooms and tomatoes in a one-pot dish. Chicken Ala King Recipe is a famous chicken recipe in a gorgeous creamy sauce that's been a household staple for many generations.